And if you have wandered off…COME BACK!!! 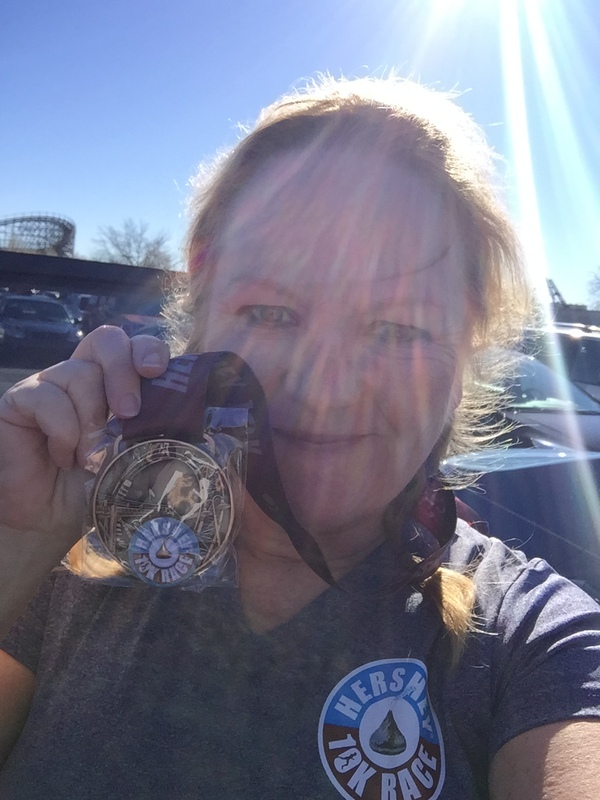 Anyway, if you’ve been around a while, you might have caught on that I love running the Hershey Half Marathon every October. Well, every October for the last 3 years anyway! So, this year I finally got my stuff together enough to make sure to register back when registration opened (maybe on Jan 1?) and was looking forward to adding this one to my yearly schedule! As with a couple other events (Hershey Half and the Marine Corps Historic Half) I headed over to Pennsylvania on Thursday afternoon. Now, normally it’s a nice drive. Uneventful. Unfortunately, I left right around the time a pretty significant thunderstorm was hitting the tri-state area so except for about 20 minutes of sunshine in New Jersey it was a rainy, tense drive! BUT…I made it to PA and Jennifer’s house safe and sound. The plan was to work at “home” on Friday and the 10K is on Saturday. Jennifer was volunteering at the finish line so we decided I’d just do day of bib pickup and we’d wing it from there! 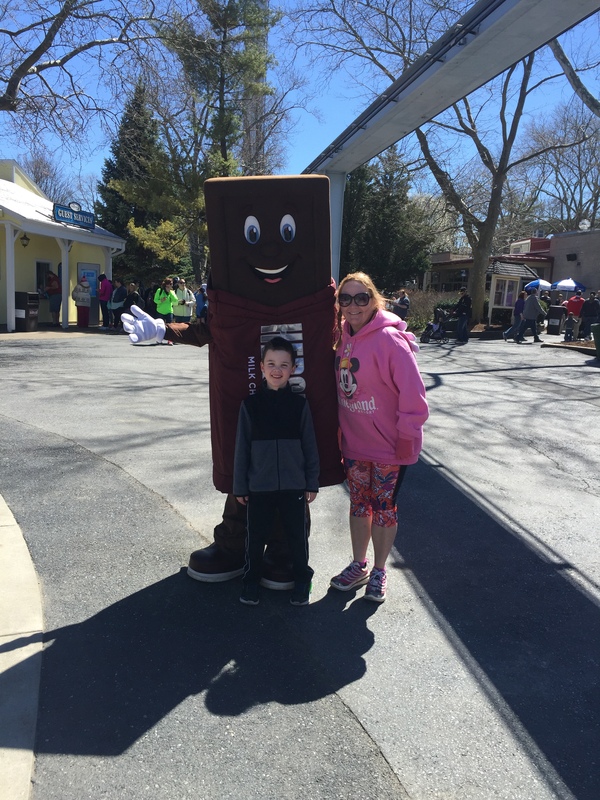 No real swag with this one – some coupons for cookies and discounts at HersheyPark. But a cute shirt! Weather was chilly and windy, I wore my Redemption capris in Frolic and a generic black pullover and my ambassador beanie! The course is obviously different from the half – it starts out the same, circling the HUGE parking lot and then instead of going into the park, we headed out to the highway. Which, in case you were wondering, is kind of a long slow climb! Then a bit around the Outlets and soon into the park, through a back gate! NB: Why is every amusement park in the world built on so many hills? ß-Legit question I would like to see an answer to! Finished the same as the half only didn’t have to run the WHOLE stadium track, just a bit – grabbed a water from Jennifer as well as my post race treat bag. ASIDE: THIS is something that Hershey does SO well. 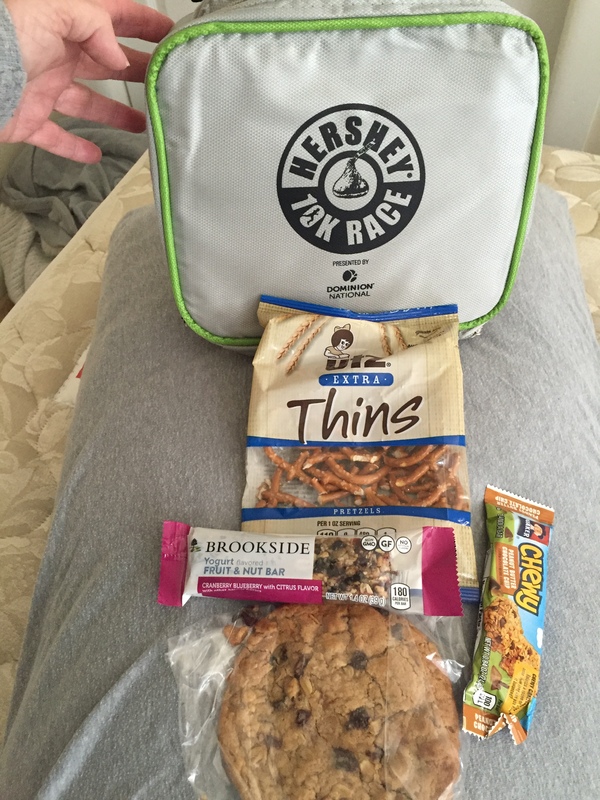 For this race it was an insulated lunch box filled with some goodies – including a gigantor oatmeal raisin cookie and a 10K Magnet! And then I headed to the car to put my things away and get ready to meet the boys to go to the park! Happily, the volunteers got a free ticket voucher so we waited in a long line to redeem and we were set to go! I spent the rest of Saturday and some of Sunday hanging with the family before heading home with Phred. 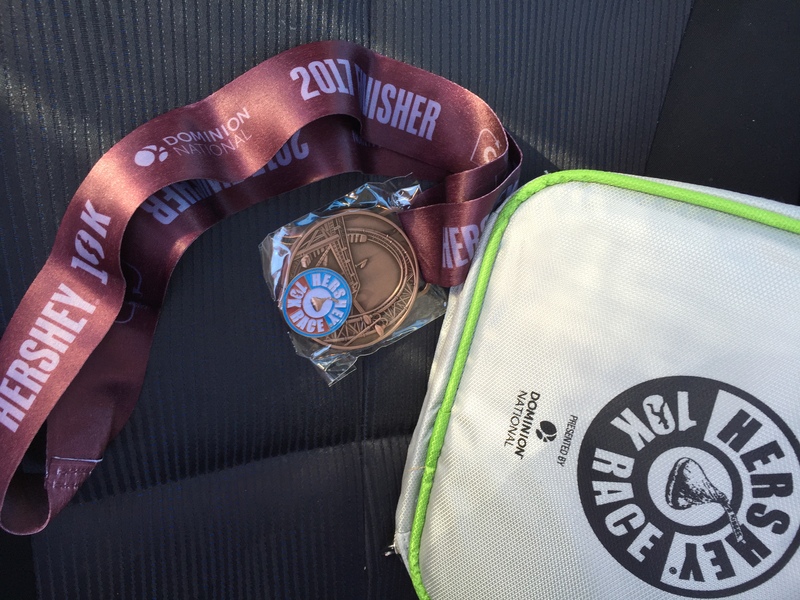 Another great Hershey / Chocolate Town Challenges event that I will likely be doing again!! My next race? Well, actually it was going to be the Walt Disney World Half Marathon – yes, the one they do in January! Also, volunteering for the Dark Side Challenge and 5K! Yep – that means I was heading down to one of my super Happy places!! But hold on, it’s about to get kind of confusing!! 🙂 Get ready to time travel! !